Home // Vault // FX Dreamline, A Fully Customizable Airgun! 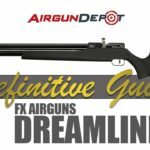 FX Dreamline, A Fully Customizable Airgun! Streamline is such a good gun, I just wish it had a larger air cylinder. Mustn’t be afraid to dream a little bigger darling. The Dreamline? The Dreamline. Bigger cylinder, moderator, amp regulator, and interchangeable stocks. Am I in a dream? The dreams collapsing. He knows, I’ve got to give him the kick. Hey how was the dream? The FX Dreamline is finally here. This is the most anticipated gun we’ve seen in a long time and it’s the most adjustable gun we’ve ever seen. You have the smooth twist X barrel system. Change calibers, change liners for different pellets. You have the amp regulator, you also have the ability to configure it in a variety of different ways by changing out the stock. Make a lightweight sporter, have an even lighter weight hunting gun with the skeletonized tactical stock. You can also make it a bullpup. This is one remarkable airgun. Now the Dreamline comes with a silky smooth side lever action I can I can actuate it with my hand on the grip no problem. It’s so smooth and so easy to pull back, it’s just ridiculous. Now the Dreamline uses the FX high-capacity magazines. These are the same found on the Crown, so in 177 you get 21 rounds, in 22 caliber you get 18 rounds, in 25 caliber you get 16, and in 30 caliber you still get 14 rounds in the magazine. Now that means that you have to use high rings. Even though it does have this angled breech here. You know which allows you to use the high-capacity magazine. You still need to use high rings. Now if you want to use medium rings like I’ve got on this gun, then you can just use the older Streamline magazine. So this is the mini magazine that holds 11 rounds, and this is the standard one that holds 14 rounds, and both these work just fine. They slip right in there. Now you’ll see that there is, they kind of float in there. But I’ve used these a ton and you have no problem, that o-ring on the magazine holds it firmly in place, it cycles perfectly same accuracy, no problem. Oh and that let us use a lower ring. Now with this gun, I like a really high cheek and for me with this gun and the medium rings, it’s just perfect. So you’ve still got plenty of adjustability that way. Now since they’re based on the Streamline, they’re all extremely lightweight. The Dreamline is very very lightweight. In fact, if you pull off the buttstock, I think this, Giles points out it’s light enough that you could actually use it as a pistol. Whether you actually could or not I mean who knows but it does tear down for easy storage, I mean it’s it’s that quick. Now the way, the classic depends on how you get the stock. It comes in this laminate, the salt-and-pepper laminate, you also have a walnut stock and FX stocks often have beautiful beautiful walnut, and you have the synthetic stock for those of you who don’t want to get worried about it getting scratched up or getting damaged by rain and wet and that sort of thing. Now, the guns have two gauges. Here is the regulator pressure gauge, it tells you what it’s set at, you can easily check it as you’re adjusting. And then you have the manometer which tells you how much pressure you’ve got in the tank. Now they fill to 230 bar, which is a little higher you know than a lot of PCPs. It’s not as high as the impact in the Crown which fill the 250 bar. It fills with a fill probe here, which you know we don’t like fill probes but it makes for, I mean it works really well nice and simple. It’s the same fill probe you see on the on the Wildcat and another FX guns. You can, because they’re regulated, use a hand pump to fill these up. You know you probably just want to fill up to about 3000 psi, after that it gets really, which is you know you know about 200 bar, after that it gets pretty hard to pump, but because the guns regulated you’ll still get a lot of consistent shots just using hand pumps so if you want to save a little bit of money you can definitely do that. Now one thing that FX is famous for is its incredibly good match triggers. They’re highly adjustable, you know for pull length for pull weight, first and second stages, and you know out of the factory they’re set about 15 ounces is what they say, but let’s go ahead and test it here. 11.6 ounces, 12.8 ounces, and 12.8 ounces, for an average of 12.4 ounces. And the trigger really is so incredibly pleasant. You’ve got a really light first stage, second stage breaks crisply cleanly, it’s really, for the money probably the best trigger out there on the market. Makes accuracy so much easier. Now you left-handed shooters out there will be pleased to note the stock on both the classic and the Dreamline is completely ambidextrous, you can see the raised Monte Carlos cheekpiece on both sides. The, you know the cocking lever is put forward and it cannot be switched to the left-hand side, that’s one the you know one issue, it’s still easy to actuate like that. You will have a problem however with the bullpup version because now that cocking lever is right here, right where you’re going to be putting your cheek, so that’s going to be a bit more awkward and uncomfortable. But that’s enough talking here, let’s go to the range and test them out and see how this shoots. I’ve got a target set down in 35 yards we’re gonna shoot 10 JSB 18 grain pellets and see how it groups. Now I’ve got the gun sighted in a little bit high, because I don’t want to shoot out my point of aim, so don’t give me any grief about missing the bullseye because I’m missing it on purpose. And let’s see how it does. And that’s 10. Now let’s run it over the chronograph, we’re gonna see how much power it’s putting out the velocity, and also how long of a shot string we get, and how consistent it is, of course. We had a high of 852 feet per second, a low of 841 feet per second for an extreme spread of only 11 feet per second and a standard deviation of 2.79 feet per second, the average was 846 feet per second which yielded a sum muzzle energy of 28.8 foot pounds of energy. Now FX informs us that the guns well be shipping out to you folks will have a heavier hammer spring than in the one weve tested, that will put your velocities up in the 880s to 890 feet per second and will be giving you about 32 foot-pounds of energy on the highest settings. And I think it’s, we’ve pretty clearly fallen off the rig by now. Now let’s talk about the accuracy first. I’m gonna show you the first group I shot when I was shooting groups. This is a five shot group. Now the fifth shot actually opened it up. The first four shots went in exactly the same hole, I mean it was a hole with virtually no diameter. Yeah the fifth shot I saw it open up, I thought oh well that groups not that good cuz I was seeing them go in the same hole, it still measures 0.08 inches across Center to Center. I mean just unbelievable, that’s five shots at 35 yards. This was the shot we shot, this is the group we shot on camera. You can see how that compares to a dime, I mean a dime just dwarfs it. It measures, center-to-center, it measures 0.12 eighths of an inch across. That is incredibly small and the thing is, it will do it over and over and over again. I mean you could you know here’s, here are the groups that I shot when I was doing the chronograph testing. I just shot one hole here and then moved it by the mill dots across here. I mean this is 14 shots. You know I mean that’s a, that’s your 0.2 to inches, that’s just a pellets width. That’s the same but that one’s the same, that one’s the same, I mean this was what I wasn’t trying and these are still under a quarter-inch. These are 14 shot groups at 35 yards. The trigger, the barrel, the accuracy, everything is just unbelievable. You know after I shot that first group I went through and showed everybody in the office. I mean it’s just that accurate and that easy, I mean it just becomes so boring. We really need to take it out to 100 yards and we’ll do that in a future video but this is impressive, impressive. And this is straight out of the box, you know I did run some clean dry patches through the barrel to clean out some of the machining. The grease and so forth. But really these barrels really settle in after about 500 shots, that’s when you really see the accuracy. Again, the regulator’s not broken in yet just incredibly good. Now you saw that, even with a brand new regulator, we had an 11 foot per second spread. I mean with a standard deviation of I think 2.7, I mean it’s incredibly good accuracy, sound, everything’s here for a thousand dollars, depending on the configuration, the gun just cannot be beat. I mean there are other guns out there that compete with, and you may like the looks and the feel and the sort of thing, but it really is just an unbelievable gun. Now as you can tell, I really really like the Dreamline. Are there things about it I don’t like? Yes, sure I mean really you know the fill port I don’t like fill probes, I have a hard time keeping track of them, of course I have a hard time keeping track of stuff in general so that’s just me, but they work fine. I like that it has a, you know, dust cover, you just remove the probe switch that it keeps it clean. You know the magazines work great for me they’re a little fiddly, but that’s such a minor quibble that it doesn’t really matter. Now I did notice that when I bumped the barrel pretty sturdily I got a point of impact shift that is you know common float barrels in general, most of you will know how to take care of your guns. So how do these compare to say the Crown, the Impact, and the Wildcat? Well this is the configuration that compares most closely to the Crown. Now this does not have an adjustable comb which for me is a big deal I like a high cheek piece. It doesn’t have a bottle in this configuration, it doesn’t have the extendable shroud, it doesn’t have the external externally adjustable hammer spring. But you still get a ton of gun for your money, but that’s kind of what separates it from from the Crown. Also the Crown has a longer barrel it’s going to be a bit a problem. In the bullpup configuration, the Dreamline has an externally adjustable hammer spring whereas the Wildcat doesn’t, but the Wildcat is capable of more power than the Dream pup is. And and again the impact has that adjustment for the valve on the front, which which none of these have. So there are differences but for the price, these are incredible guns, I really have a hard time believing that I’m not dreaming. Now if this video has been helpful, please like, subscribe, make sure to ring that notification bell, and if you have any questions or comments leave it in the section below, we’ll try and answer those. And we really appreciate all the comments you guys leave us, but really for a thousand bucks for the basic model it’s almost like I’m dreaming. Am I dreaming?